If you’d rather amble than hike, Yosemite Valley loop is a 18-kilometre trail that gently winds around the valley floor, underneath Yosemite’s mammoth granite cliffs. The loop takes a full day to complete but there’s an option to stop at any point and take a bus back to your base camp. Make sure you take a break below the towering El Captain - a sheer-faced monolith that casts cool shadows over Merced River. 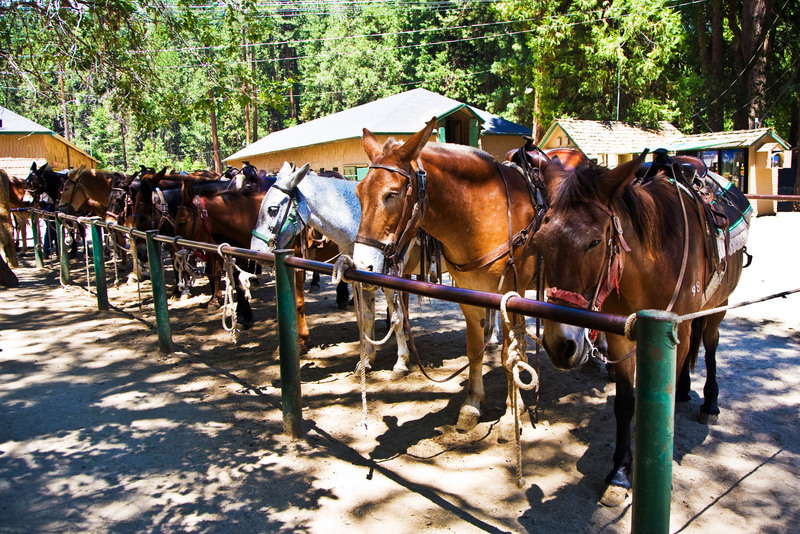 Saddle up for an afternoon and explore the raw wilderness of Yosemite on horseback. You can do two-hour or full day treks from one of the three stables within the park boundaries. Ride over the pebbled creeks and shrubbery along the Valley Loop trail, passing through blossoming open meadows along the way. No experience with horses is necessary, however riders must be aged seven years and above. Yosemite’s pride and joy, the Half Dome is both the most recognisable landmark and the most dangerous hike in the park. The view from its peak is iconic and unsurpassed; however, it’s only accessible by scaling it (picks, ropes, helmets and all). Gaining over 4,000ft in elevation this hike is not for the faint hearted. So if you’re a skilled rock-climber, go for it, but if you’re a mere mortal like the rest of us the Panorama trail (above) is your best bet for the best views. If camping isn’t your thing (no judgement here), the Ahwahnee Hotel is the place for you. Stone fireplaces and stained-glass windows add to the hotel’s rustic décor, with guest rooms exuding elegance and cosiness. The dining hall is especially impressive and serves the best food in the park - why eat tinned tuna when you could have grilled pacific swordfish or crispy duck confit? If you’d rather amble than hike, this 18-kilometre loop trail gently winds around the valley floor, underneath Yosemite’s mammoth granite cliffs. The loop takes a full day to complete but there’s an option to stop at any point and take a bus back to your base camp. Make sure you take a break below the towering El Captain – a sheer-faced monolith that casts cool shadows over Merced River. The 13.5-kilometre Panorama Trail begins at the magnificent Glacier Point – a lookout (accessible by bus), with panoramic views over the park. Take in your surroundings here before heading downhill through a vast gorge filled with sequoia trees and crashing waterfalls. Have lunch at Nevada Falls – a beautiful rock ledge that overlooks the iconic Half Dome (more on this later) – before continuing down a rocky path that finishes at Happy Isles Nature Centre. 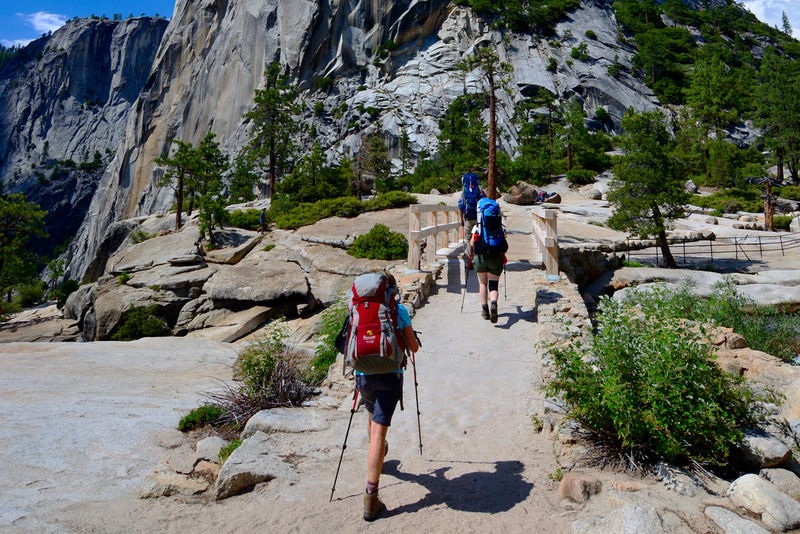 If you’re feeling fit, start your hike with the Four Mile Trail beforehand, beginning at the Yosemite Village centre. It will test quad strength and lung capacity, but the magical views are worth the sweat. Then continue onto the Panorama Trail for the most remarkable views of Yosemite in a day. Yosemite’s pride and joy, the Half Dome is both the most recognisable landmark and the most dangerous hike in the park. The view from its peak is unsurpassed, however it’s only accessible by scaling it (picks, ropes, helmets and all). Climbing over 1220 metres high, this hike is not for the faint hearted. So unless you’re a skilled rock-climber, the Panorama trail (above) is your best bet for the breathtaking views. Saddle up for an afternoon and explore the raw wilderness of Yosemite on horseback. You can do two-hour or full day treks from one of the three stables within the park boundaries. Ride over the pebbled creeks and shrubbery along the Valley Loop trail, passing through blossoming open meadows along the way. No experience with horses is necessary, however riders must be aged seven years and above. Yosemite’s Wawona Golf Course is quite possibly the world’s most beautifully located, with its lush greens blending flawlessly into the natural surroundings. You can enjoy nine holes and a lunch for $25 as a part of the club’s ‘Nine and Dine’ offer. If you need of a break from the great outdoors, spend an afternoon inside at the Ansel Adams Gallery. Lining the walls are haunting, black-and-white images of the valley, taken by Adams himself. There are also a number of other exhibitions that rotate monthly, featuring paintings and photographs inspired by California’s wilderness and landscapes. Situated on river bank resembling an inland beach just outside the village centre, Swinging Bridge is a heavenly picnic spot. It’s a delightful place to cool off in the river after a long hike, or take nap under a feathery cedar tree. Clear blue skies are mirrored in the still water of Tenaya Lake, surrounded by a sandy shoreline, pine forest and granite rock. You’ll find it just before the entrance of Tuolumne Meadows – a short drive from the centre of the valley. Hiring a car before making your journey to Yosemite is the easiest way of getting in and around the park. Be sure to pay a bit extra for a sturdy vehicle and skip the little city-driving option. There’s a free hybrid shuttle bus service that runs throughout the park, and it’s an easy way of getting from A to B. But be aware though that it is so slow, so come prepared with a book or iPod for the journey. Rent a bike and spend a day cycling along paths of wildflowers and sequoia trees. It’s a cheap and fun way to get around the valley floor. Popular with rock-climbers and thrill seekers alike, Camp 4 is located at the bottom of Yosemite Falls and reservations are made on a first-come-first-serve basis. A stunning camping spot thick with pine trees and enclosed by huge boulders, it’s worth the early morning wake up call to get in line for a spot. Situated amongst a Disney-esque setting of open meadows, a natural spring and wild elk roaming between lofty trees, Tuolumne Meadows Lodge is a firm glamping favourite. Stay in one of the charming canvas cabins, complete with a wood-burning stove and old-school lantern for light. While many stay at Curry Village for its central location, Tuolumne Meadows is only slightly further afield and half the price (plus less crowds). 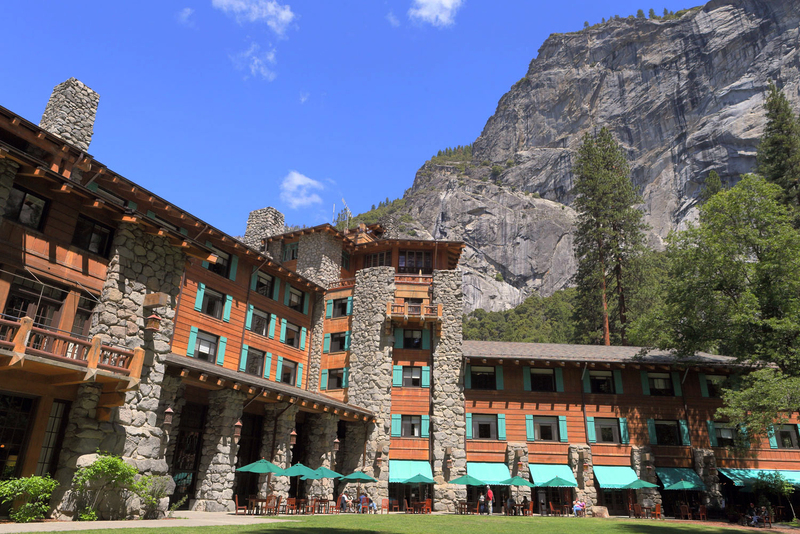 If camping isn’t your thing (no judgement here), the iconic hotel most famously known as the Ahwahnee and renamed in 2013 as the Yosemite Majestic Hotel is the place for you. Stone fireplaces and stained-glass windows add to the hotel’s rustic décor, with guest rooms exuding elegance and cosiness. 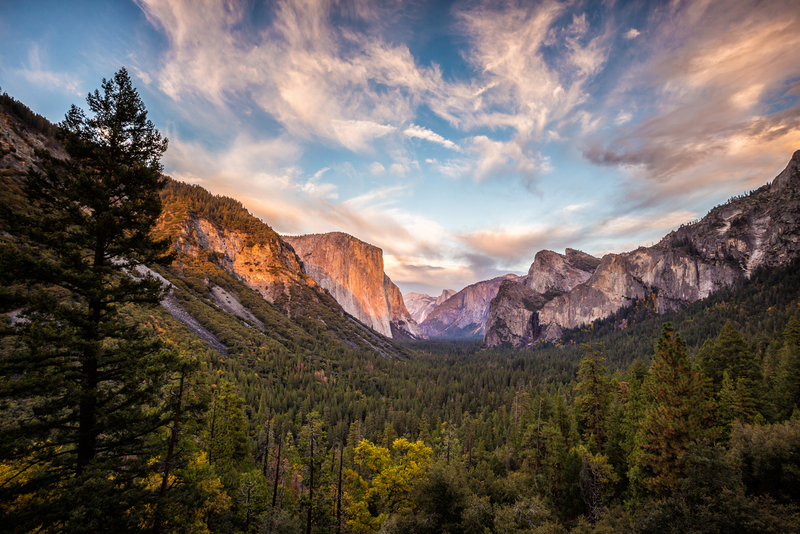 If you’re travelling to Yosemite during the Northern American summer, be sure to book in advance!